It provides you function to add, edit, make the screensaver using your favorite photos and music. Professional user interface and very easy to use. Choose from transition effects for your screensaver. 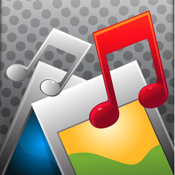 Multiple music files for a single screensaver is supported. Easily control for individual photos. Easily to organize your photos into multiple albums. Auto/manual synchronize audio & video, Wifi photo transfering and more!! !